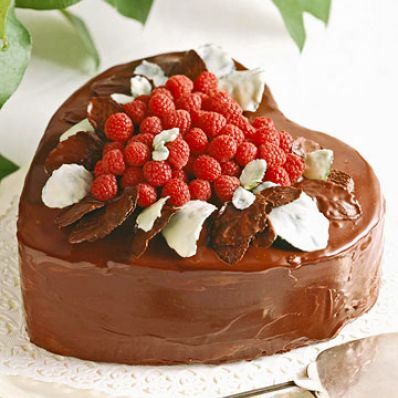 Chocolate-covered mint leaves and fresh raspberries make delicious garnishes for this mint-flavored chocolate cake. 1 of 9 Heat oven to 350 degrees F. Grease two 8 x 2-inch (6-1/2 cups) heart pans. Line bottoms with parchment or waxed paper; grease paper; dust pans with flour. 2 of 9 Prepare Basic Chocolate Cake, substituting 1 to 2 teaspoons mint extract for vanilla, and pour batter into prepared pans. Bake in 350 degrees oven for 45 minutes. Unmold and cool, following recipe directions. 3 of 9 Reserve enough of largest mint leaves to fill top of cake. Wash, drain and thoroughly pat dry. 4 of 9 Meanwhile, mix semisweet chocolate chips and 1 tablespoon shortening in small, heavy saucepan over low heat, stirring until chocolate is melted and smooth. Repeat in another pan with white chips and remaining shortening. 5 of 9 Brush tops of half of mint leaves with semisweet chocolate, and other leaves with white chocolate. If chocolate hardens, return saucepan to low heat, stirring. 6 of 9 Place leaves over rolling pin to give rounded shape to coated leaves. Set aside to harden. Recoat if desired. 7 of 9 While cake layers are cooling, prepare Chocolate Ganache Frosting and Glaze, substituting 1/2 to 1 teaspoon mint extract for vanilla. 8 of 9 When cakes are completely cooled, slice off rounded top if necessary to flatten (reserve trimmings for snacks ). Invert one layer on serving plate. Spread 1/3 to 1/2 cup of refrigerated ganache over top of layer. Place second layer on top, bottom up. Spread remaining refrigerated ganache over sides of cake, using a long, thin metal spatula to smooth as evenly as possible. Chill for 1 hour. 9 of 9 Pour the room-temperature glaze over the top of the cake. The glaze should be thick, but pourable. If too thick, gently fold in 1 to 2 tablespoons heavy cream; avoid creating bubbles. Smooth carefully with long, thin metal spatula to coat top and sides of cake. Refrigerate for 1 hour until firm. Spoon raspberries onto top center of cake. Arrange the chocolate mint leaves all around the remaining top of cake. Makes 16 servings. 1 of 1 If 2-inch-deep heart-shaped pans are not available, fill two 8 x 1-1/4 inch (4-1/2 cups) heart-shaped pans with 3 cups batter each. Spoon the remaining batter into 8 greased 2-1/2-inch muffin-pan cups, filling each about three-quarters full. Bake cakes, including cupcakes, in the heated 350 degree F oven for 20 minutes or until wooden pick inserted in center comes out clean. Cool cakes in pans on wire rack for 5 minutes. Remove cakes and cupcakes from pan to wire rack to cool completely. Frost and decorate if desired (additional frosting must be made if decorating cupcakes, or use prepared frosting).